grass ablaze. The consequence of his disobedience nearly endangered the entire forest and almost burned down neighboring cabins. I learned several difficult but important lessons that day. Perhaps the biggest lesson was the need for obedience. Rules and laws are created to keep us safe. When we obey those rules, we can avoid the dangers that can come from something as small as one little match. 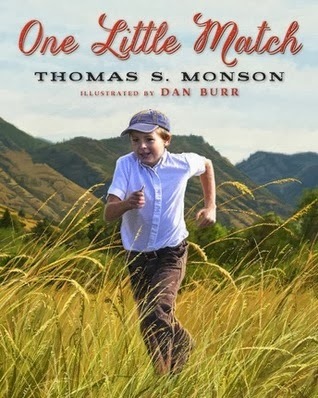 I loved the story in this book when President Monson gave it in conference and I love it even more in this format. I could hear President Monson's voice and when that's combined with the gorgeous illustrations, it gets even better. This is a wonderful book for everyone. I plan to use it for Family Home Evening. I read it to my little nieces that were staying with us. It's messages is profound and important and it's told in such a beautiful, simple way. I have a children's Christmas book that at some point will need an illustrator and after seeing the pictures in this book, I've decided I'd be lucky to have the talents of Dan Burr. I highly recommend this book. It's beautiful.